Nikon's new Coolpix point-and-shoot line leaked yesterday, but today Nikon unveiled the official US prices and specs (though no release dates) for all four cameras, including the crazy S1000pj with the built-in projector. MELVILLE, NY (Aug. 4, 2009) – Nikon Inc. continues its tradition of innovation, design and performance with the introduction of four new COOLPIX Style Series compact digital cameras. Building on the success of Nikon's previous touch-screen models, the ultra-stylish COOLPIX S70 features an enhanced interface and organic light-emitting diode (OLED) display technology for a new user experience, housed in a stylish, camera body. The COOLPIX S1000pj features the world's first built-in projector, which enables consumers to share their images and videos in an all-new fun way. Additionally, the COOLPIX S640 and COOLPIX S570, leaders in speed and affordability, respectively, complete the new smarter, cooler, simpler COOLPIX line. 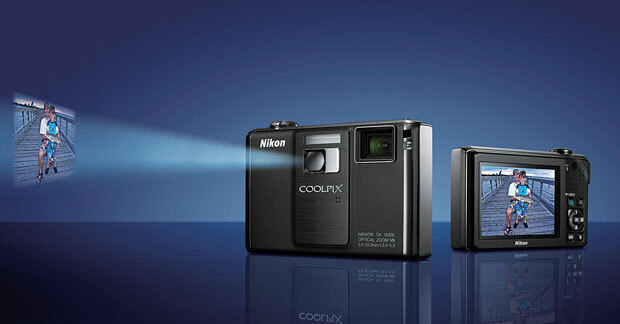 "These latest Nikon COOLPIX digital cameras reflect hallmarks of the COOLPIX line: performance, design and innovation," said Bill Giordano, general manager marketing, COOLPIX for Nikon Inc. "With new features such as a built-in projector and new touch controls for viewing, shooting and zooming, these COOLPIX cameras will appeal to users of every level." The Nikon COOLPIX cameras incorporate Nikon's world-class NIKKOR lenses, delivering accurate detail and brilliant colour, as well as Nikon's EXPEEDTM digital image processing concept, which ensures high-quality pictures with stunning colour and sharpness. A new enhancement to Nikon's Smart Portrait System that helps create beautiful portraits includes an all new Skin Softening feature designed to both smooth and even skin tones. Other COOLPIX features include Vibration Reduction (VR) Image stabilisation, minimizing blur that may appear in pictures, even in low-light or unsteady conditions; and Scene Auto Selector, which automatically recognises the shooting situation and adjusts camera settings accordingly. Built on the success of Nikon's previous touch-screen models, COOLPIX S70 features Nikon's newly developed 3.5-inch Clear colour Display and a new generation of touch-screen controls that offer an enhanced shooting and playback experience. In addition to its photographic technology and stylish dual-texture design, the S70 captures stunning HD-video at 1280x720 pixels (720p). New to the COOLPIX line, OLED technology offers the benefits of vivid colour reproduction, sharp contrast and the absence of afterimages. The capacitive touch-screen provides an immediate response at the lightest touch of the display for a fun and intuitive feel to every camera operation. For example, using the Touch Shutter feature, users can have a completely "button-free" experience and focus on and photograph a subject by simply touching it on the camera's display. The touch-screen also makes viewing and retouching images more fun and efficient. With the swipe of a finger, users can scroll through images and use a pinching motion with two fingers to zoom in or out on displayed images, switching between thumbnail and full screen views. Additional new touch-screen controls include on-screen sliders for adjusting brightness and Scene Effect Adjustment, which offers controls specific to the scene mode in use. The COOLPIX S70 features 12.1 megapixels; a 5x wide angle zoom NIKKOR lens; ISO 6400***; 5-way VR Image stabilisation System; Subject Tracking; Scene Auto Selector Mode; Nikon's Smart Portrait System and an ultra-stylish design. The S70 will be available in September 2009 for $US399.95 MSRP in a choice of colours and textures including Red & Red, Champagne & Beige, Black & Black, or Champagne & Light Brown. Providing consumers with new exciting ways to share images, the COOLPIX S1000pj transforms photo-sharing into a multimedia experience. With the touch of a button, users can project images and videos as large as 40 inches, and with the camera's unique slideshow function, playback pictures with music, effects and creative transitions. Additional features of the S1000pj include: 12.1 megapixels; a 5x Wide Angle Zoom-NIKKOR Glass Lens; ISO from 64-6400***; a 2.7-inch Wide Angle LCD display; 5-way VR Image stabilisation System; Subject Tracking; Scene Auto Selector Mode; Nikon's Smart Portrait System and movie mode. The COOLPIX S1000pj will be available in Matte Black, in September 2009, for $US429.95 MSRP. For consumers who never want to miss a moment, the all-new COOLPIX S640 is Nikon's performance leader in the S-Series lineup. High performance features include ultra-fast auto-focus, the fastest start up time in its class** of a mere 0.7 seconds and short shutter release time lag. Additional features of the S640 include: a slim, stylish all metal body; 12.2 megapixels; a 5x Wide Angle NIKKOR lens; ISO from 100-6400 at full resolution; a 2.7-inch Clear colour LCD display; 4-way VR Image stabilisation System; Subject Tracking; Scene Auto Selector Mode; Nikon's Smart Portrait System and movie mode. The COOLPIX S640 will be available in September 2009 for $US249.95 MSRP and will be offered in various colours including: Calm Black, Velour Red, Precious Pink, and Pearl White. Where style meets simplicity, the new COOLPIX S570 is ideal for entry-level consumers looking for a carefree shooting experience. The S570 features 12.0 megapixels; a 5x Wide Angle Zoom-NIKKOR Glass Lens; ISO 3200 at full resolution, a bright 2.7-inch LCD Display; 4-way VR Image stabilisation System; Scene Auto Selector Mode; Nikon's Smart Portrait System and movie mode. The COOLPIX S570 will be available in September 2009, for $US199.95 MSRP and will be offered in various colours including Black, Red, Blue, and Pink.